I watch very little television these days. Mostly, I just don't have the time, and when I do, I would generally rather read. However, when I found out that Netflix in the UK would be getting Star Trek: Discovery, I admit I was a tad excited. Both The Next Generation and Deep Space Nine were important shows during my formative years (especially as their air-times seem to coincide with Dad's homemade pizza nights). Unfortunately, none of the Star Trek that has been produced since then has really been what I wanted. Well, I have just watched the first two episodes of Discovery, and I have to say, I really enjoyed them. It manages to feel like classic Trek, but also to establish its own identity. Lots of action, but also some good character depth, at least for the main character. The end of the second episode really leaves the series hanging in the dark, so I'm excited to see where it goes. 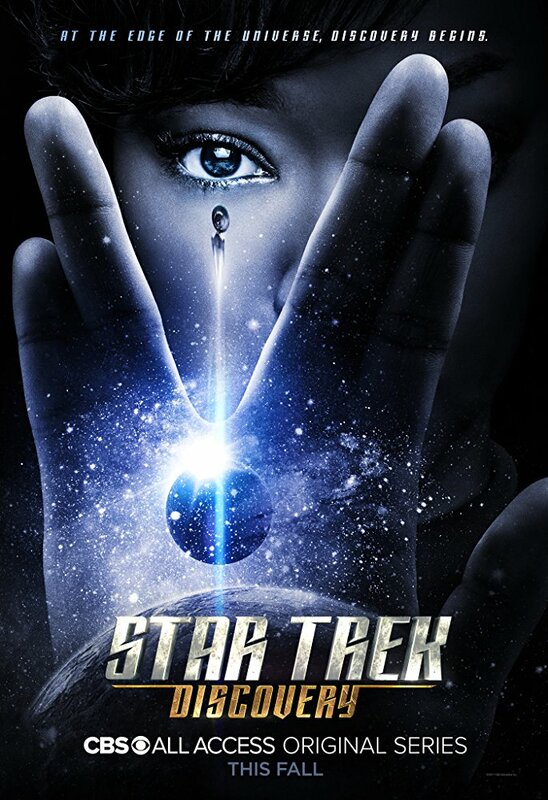 Anyway, if you are a Trek, or even sci-fi, fan, and have Netflix in the UK (or whatever it is showing on in the US), then you should probably give it a try. The Frostgrave: Ghost Archipelago Nickstarter is in its final week. Already, £20 will get you the rulebook, 5 treasure tokens, a special crew sheet, and 2 exclusive metal miniatures. Not bad, and there is a good shot at a third exclusive mini before it is all done. I will, of course, be revealing more as we get closer to launch time, but for now you will just have to enjoy this early cover mock-up. This only has the artwork at low-resolution and not quite in its final alignment. Finally, I’d like to take a second to address a comment that blog reader, Phil, made about Ghost Archipelago and its perception as a ‘Pirate Game’. There has, indeed, been some confusion in the wargaming community. Some people have written Ghost Archipelago off because they don’t play pirate games. In truth, this is probably my fault. Early on, when I was talking about the game, I did use the ‘p’ word a couple of times. In my mind, I was just using it as short-hand for a specific type of setting – lots of jungles, boats, lost treasure, the like. But, of course, Ghost Archipelago is really a fantasy game, filled with heroes, magic, and fantastical creatures. The players are not pirates (unless they want to be) and ‘piracy’ has no real part in the game – no one is seizing ships at any rate. So, if you don’t like ‘pirate games’, then don’t worry, this is a fantasy game. 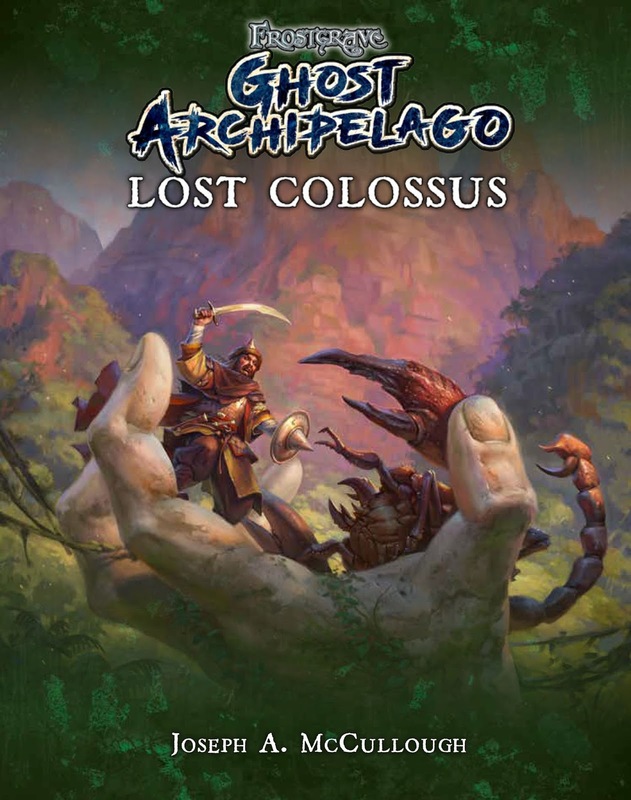 If you do like ‘pirate games’, you will probably enjoy a lot of what Ghost Archipelago has to offer, if you don’t mind a good chunk of fantasy as well. These days, when I'm working on a supplement for Frostgrave, I tend to jump all around the book when writing it. I write a scenario, then some magic items, then some background. I find it easier that way. However, when I wrote the original rulebook, I wrote pretty much the whole thing in the order it is printed. That includes the scenarios. Looking back, I realize this was probably a mistake. This means the first scenario in the book is 'The Mausoleum'. I love this scenario, but it is perhaps not the best scenario to play if you've never played the game before. It's got a lot of skeletons, and with new players, who are likely to be less aggressive since they are less familiar with the rules, you can end up with even more skeletons. Many players end up fighting skeletons and never actually come into contact. Oh well, live and learn. In the meantime, I realized I needed to boost my skeleton numbers a bit and recently finished painting this guy. His pieces come completely from the Frostgrave Cultist box. I must say, I actually much prefer painting skeletons with their clothes on. I never had good luck painting all bones. The Frostgrave: Ghost Archipelago Nickstarter has now been running for a week-and-a-half, and already it stands at nearly £30,000. If you've never heard of a 'Nickstarter' before, it is basically a pre-order program where if the total order value passes certain thresholds, everyone gets some freebies. It's not a crowd-funding program. Everything for Ghost Archipelago is now either made, or is in the final stages of being made. This is just a chance to get in at the beginning. The £30,000 mark is significant because it means everyone who placed an order will get a free metal Drichean Warrior figure to go with the free metal Snake-man that was added when the orders hit £20,000. If you are planning on getting the book anyway, you should really consider ordering through the Nickstarter. For £20 (the cost of the book) you'll also get 5 treasure tokens, a special Crew Sheet, and the two metal figures mentioned above. A new Warriors of Athena campaign! 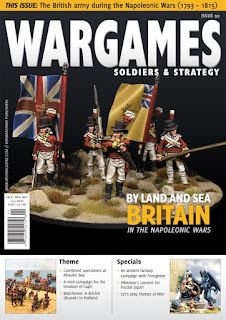 I have just received Issue 92 of Wargames: Soldiers and Strategy which includes 'The Witch of Mount Gramos' a three-scenario campaign I wrote for Warriors of Athena. If you are not aware of Warriors of Athena, it basically takes my Frostgrave rules and uses them to play solo wargames in the world of Greek Myth. To use this new set of adventures, you'll need both the Frostgrave rulebook and the original set of Warrior Athena rules found in Wargames: Soldiers and Strategy Issue 86. In this campaign, your ancient hero has to scale the heights of Mount Gramos, battling a giant, a nest full of harpies, and a witch who has offended the gods of Olympus. 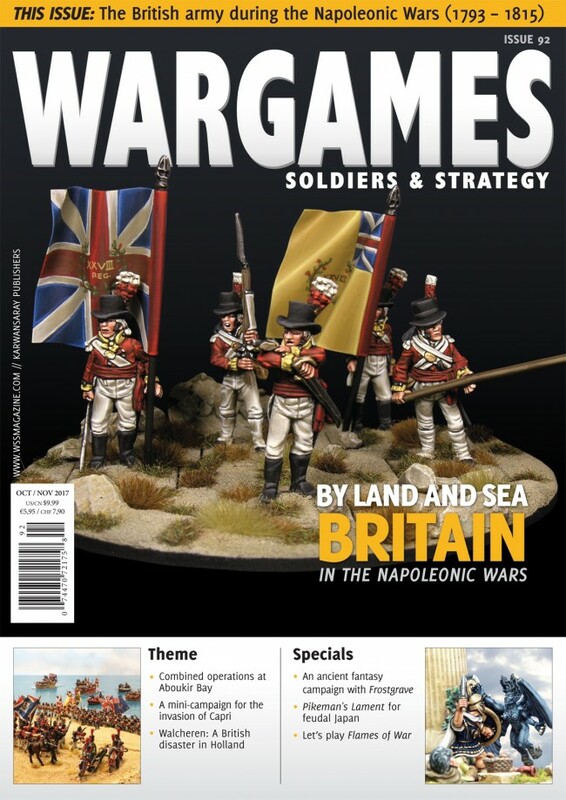 The main theme of the issue is Napoleonic, but it also includes articles covering the American Civil War, Ancients, Medieval Japan and more. 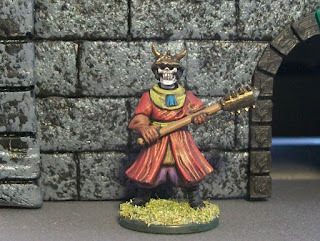 My latest addition to my personal Frostgrave collection is a simple skeleton. You just can’t have too many of these guys, and frankly, I don’t have enough of them! It is made with pieces from the Frostgrave Cultist box set, which delightfully includes some undead bits. A few eagle-eyed readers have noticed that my figures lately have been based on very small bases. 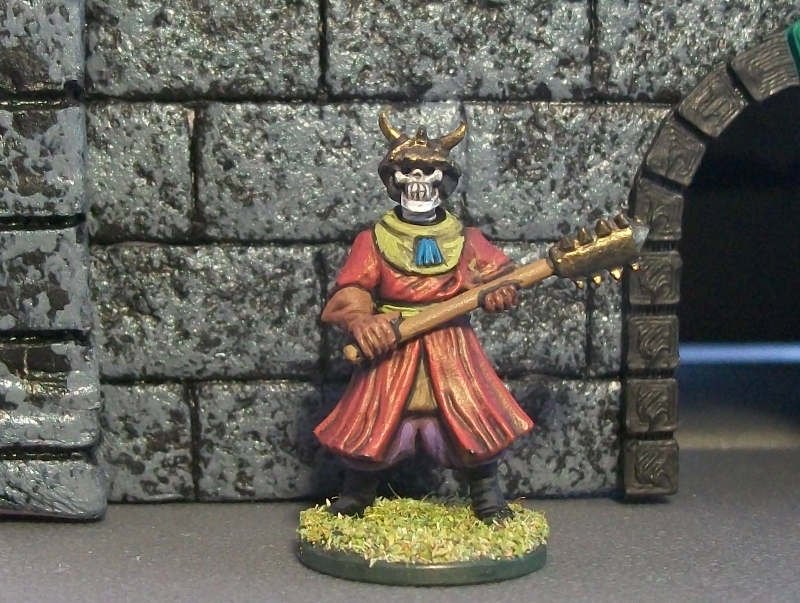 In fact, this skeleton is on a 20mm round base. Recently, I decided that I would try to mount most of my minis on these smaller bases. Mostly, I just find the bases more visually appealing. With the industry seemingly pushing for bigger and bigger figures, with larger bases, I’ve come to realize, I like my miniatures to look, well, miniature. Also, I find bases boring, so the less I have to worry about painting and flocking them, the better! There is a practical reason as well. Smaller bases mean larger tables. Okay, not really, but look at this way. If you compare a 20mm base to a 32mm base, you’ll see how much less space the smaller base takes up on the table. On a small 2’ x 2’ table, the difference between 20 minis based on 20mm bases and 20 minis on 32mm bases can be quite significant. More room to manoeuvre generally makes for better games.